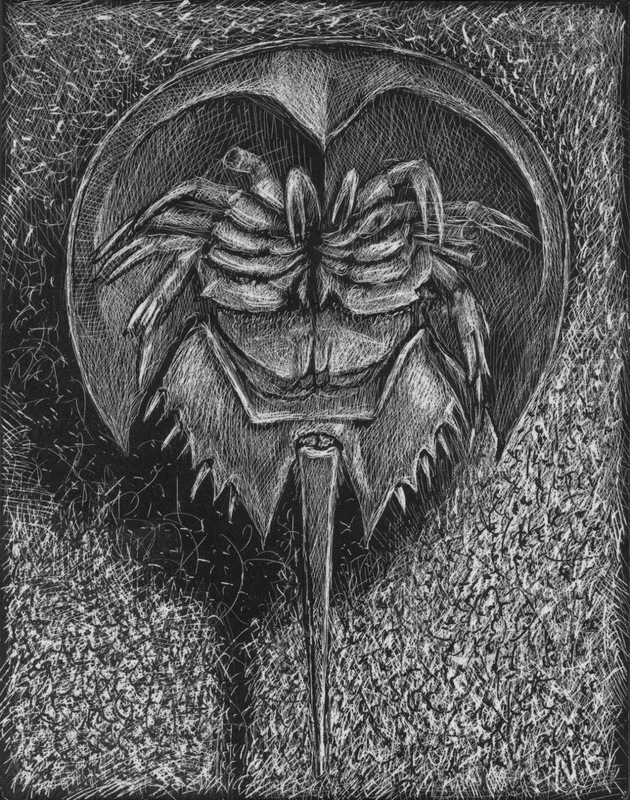 This is a scratchboard drawing of the ventral side of a cast-off horseshoe crab shell.The shell is thin and brittle. A couple of claws are missing from its delicate legs. It was collected two decades ago, from the beach at the mouth of the Housatonic River, where crabs lay their eggs in June. It still rattles with sand caught inside. We owe something to these crabs. . . not long ago they were rounded up for fertilizer, like lobsters once were. But also like lobsters, we've found better things to do with them. Ancient blue-bloods, they are, and today, we put that blue blood to work, saving human lives. This scratchboard drawing is 4.25" x 5.5", mounted on panel, and will be initially offered through auction on EBay.